NEW! Abundance Affirmation Cards - Order here! Value bundle of our financial wellness product collection so you can forge your own path. When it comes to creating wealth and wellbeing, your mindset, thoughts and emotions have a much greater influence than you may realise. Uncover your money beliefs to boost your chances of having more 'wellth' in your life. Want to create a more authentic and conscious relationship with wealth and money? 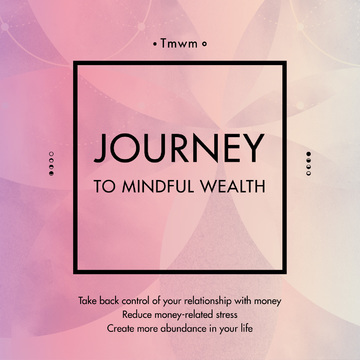 Get 30 days of mindful wealth tips as an instant download ... no need to wait for daily emails to start bringing more mindfulness to your wealth! A 6-week interactive online course which takes you on a personalised journey to abundance. Explore the mindset, knowledge, tools and support you’ll need to create a better relationship with money. This Chakra Balancing Money Meditation is a guided meditation and sound healing designed to take you on a relaxing journey to heal your relationship with money by gently opening and balancing your chakras. Learn how introducing a mindfulness approach to your money habits (what, when, why and how you do the things you do with your money on a day to day basis) can create a life full of Wellth. Become more intentional and purposeful with your money behaviours today!